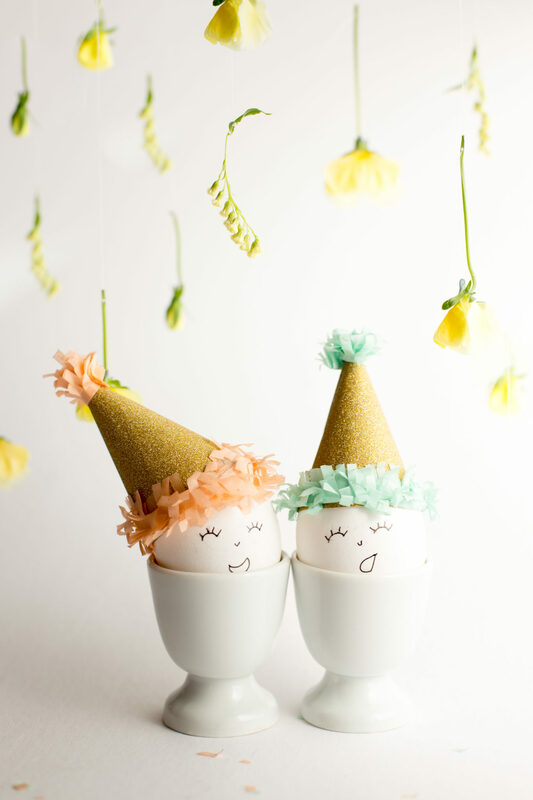 I’m so excited about these quick little DIY Easter Eggs. Eggs are just so cute with little faces on. Last year, I gave the darlings little floral crowns. 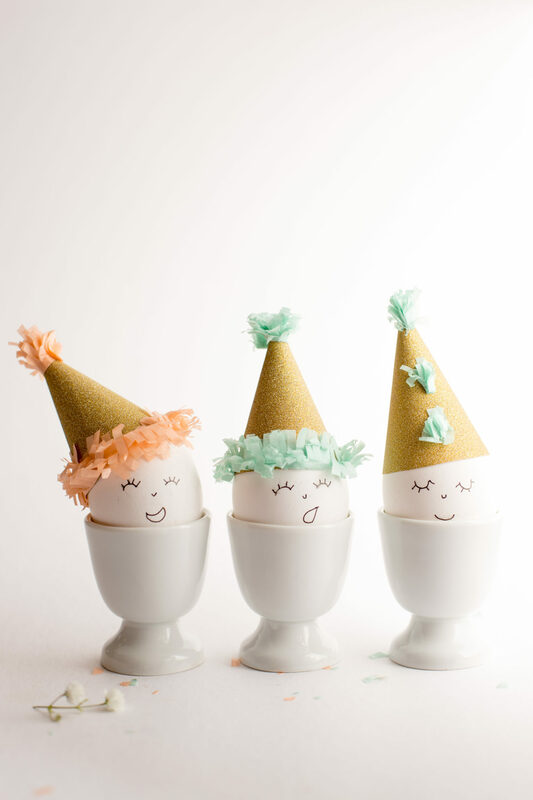 This year, I thought they needed some party hats! 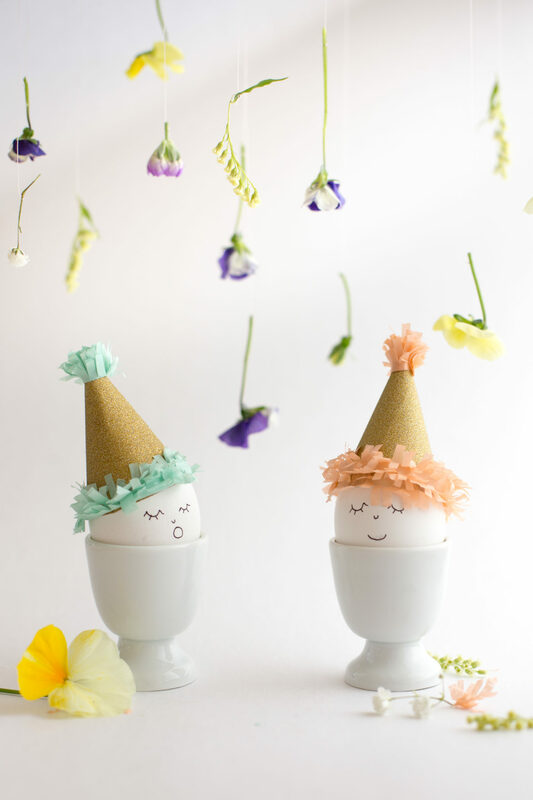 And, of course, they need a DIY floral backdrop, like any good, blog-crazy, diy-doing eggs. I have to say, coming across the pansies in the grocery store made my day. I am so ready for spring, and Easter always makes me excited for the promise of summer. I just knew they had to be part of my little scene. 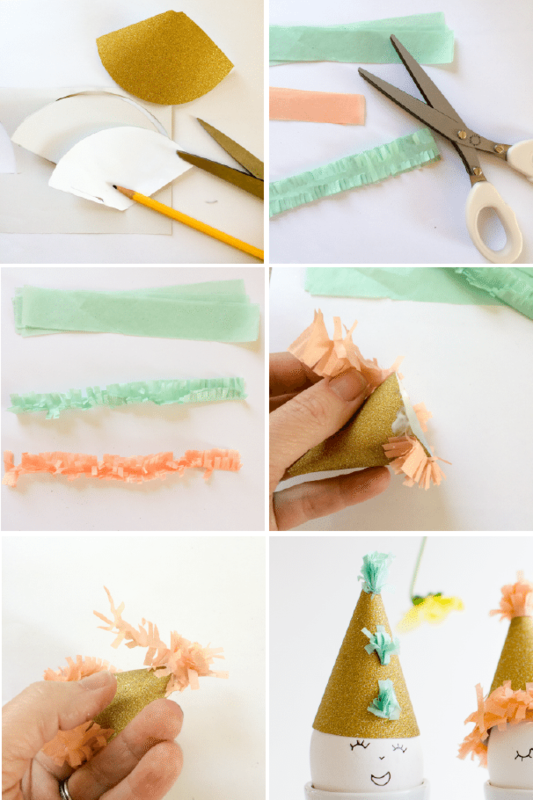 Making the little party hats was super fun and quick with the little party hat template and a pair of fringe scissors. 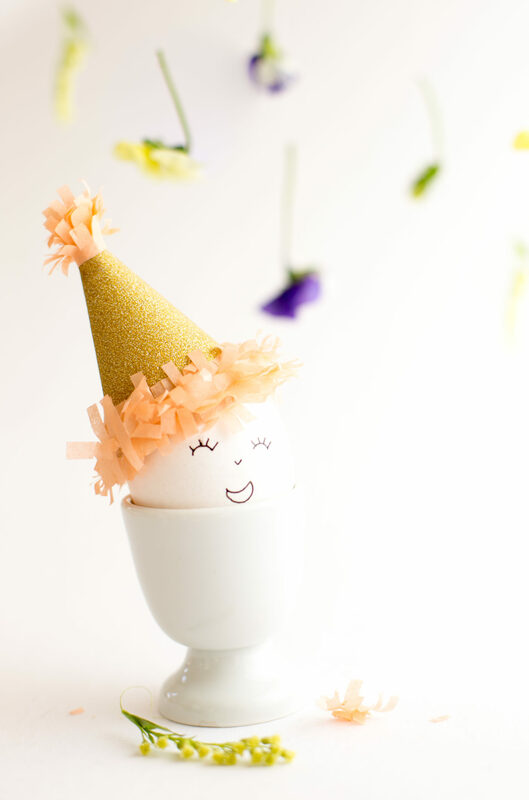 :: Print out party hat template and adjust scale to suit your egg size. Draw around template with a pencil on desired decorative paper. Shape the template into a cone and use craft glue to secure a 1/8″ overlapping edge. :: Cut out 1″ x 6″ strips of tissue paper from a stack of 4 layers. Use fringe scissors (I have to say these are awesome!) or regular scissors to fringe both edges of the strip. :: Fold the fringe strip in half with one end sticking up higher than the other. :: With fringe pointing upward, use craft glue to secure the fringe strip to the edge of the hat. :: Cut a smaller strip 1″ x 3″ and fringe both edges similar to above to make the top pom pom. Spin the fringe around the top of the hat securing with glue. :: For little tufts, cut even smaller strips and spin them into little poms and secure with glue. To make the floral backdrop, simply use a needle and thread to go through the stems of the flowers. Knot one end of the thread and use the other end of the thread to hang the blooms. I hung the flowers from three lines of thread hung above the eggs heads. This tutorial was put together as part of #12MonthsofMartha blogging team. Her team of 14 bloggers get a box of craft goodies each month to inspire us to create something lovely together for you! I can tell you I’m smitten with these guys! I hope you have a chattery good Easter yourself. More Easter Egg loveliness coming up this week. These are so cute! 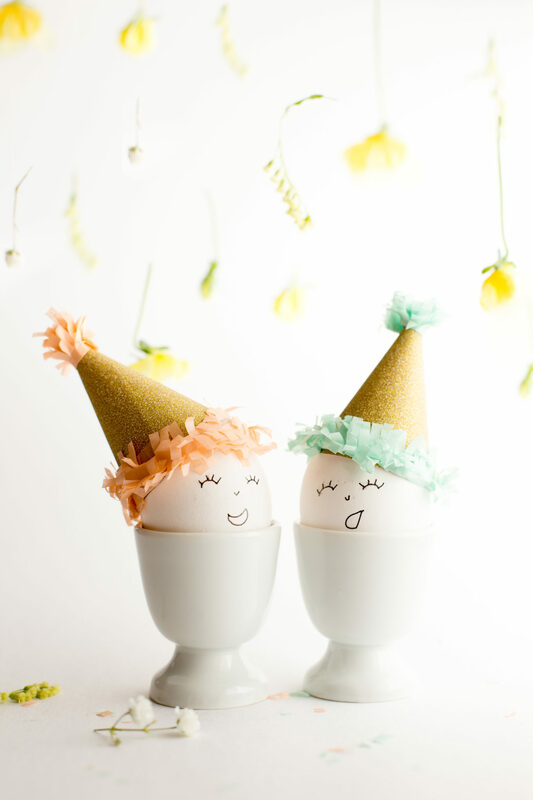 I love the party hats! These are so funny and made me laugh so much! They have your subtle and clever touch, Anne! 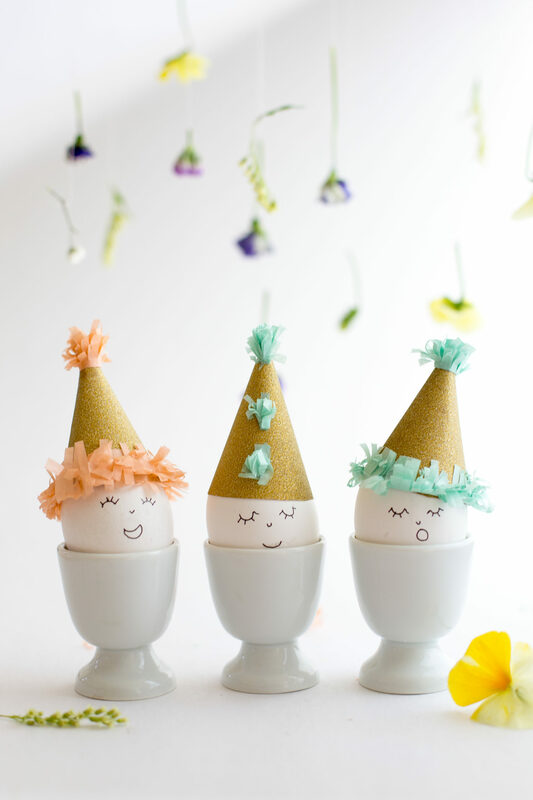 Happy eggs for a Happy Easter! Thanks so much, Bobbie – your new site looks FAB!!! Wow, sooo cuite. I will try to make it indeed! Thank you for the tips!